A recent news story reignited, for me at least, this debate around sensitive handling of the Atlantic Slave Trade. The Telegraph carried a story where a grammar school had asked students to buy slaves, focusing on the physical characteristics and cost of the enslaved. The exercise was meant to introduce the students to the economics of the slave trade, by asking them to step into the shoes of slave traders and purchase the ‘best’ slaves for the plantations/companies. A local businesswoman, and presumably a parent, posted this on Facebook which brought this misguided lesson to the wider attention of the public. [is] a-historical at best and insensitive at worst. 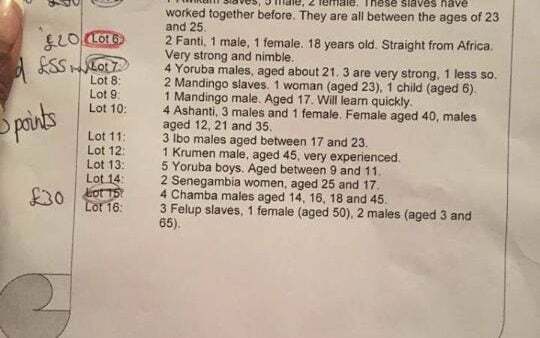 Would you re-enact an Auschwitz selection asking which of the following Jews you would select for slave labour… The problem with the Slave Auction activity is that it is undertaken from the perspective of the Slave Owners and Slave traders and the voice or perspective of the people who were slaves is either overlooked or they are portrayed as anonymous victims. The topic didn’t engage many in the group and this, I think, partly indicates the lack of a deeper understanding in the UK’s teaching industry around race and the issues that surround it. In Scotland, for example, our general profession is struggling to attract ethnic minority teachers, and most classrooms in Scotland have a white majority, and so the issue of racism and its impact upon students is rarely taught in any detail to practitioners. In a wider sense, though our society at large is seen as more tolerant and left-wing than our American cousins, race is still a topic that few would profess true understanding of, never mind having engaged in critical dialogue around. But this must change. To paraphrase a great man, if there is no struggle, there is no progress, and the struggle here is realising that we are using outdated and unfit ideas to teach lessons. One of the links Phillips provided leads to an article by Dr Kay Traille, which discusses the affect teaching of slavery can have upon black students. This, based upon work for her thesis, highlights some worrying concerns. She starts by noting from Husbands and Pendry that “[w]ork in history education may have under-estimated the extent to which children’s capacity to respond to historical tasks is affected by issues of emotional and affective maturation“.1 Students of African-Caribbean descent, she found, “felt implicitly and explicitly negatively stereotyped by teachers and peers because of their black heritage“.2 Something that we should do before we go into detail on the topic of the Atlantic Slave Trade is explain that slavery is a major phenomenon throughout all human history, not just something that happened in the New World, nor one limited to our period of study. This positioning allows the students to understand it as the ages long human problem it is, rather than solely one of ethnicity, an issue than can occur if it is taught in a vacuum. A great video for this is “The Atlantic Slave Trade – Crash Course”, with the (energetic!) presenter providing an excellent overview, but also importantly putting it into the larger context. 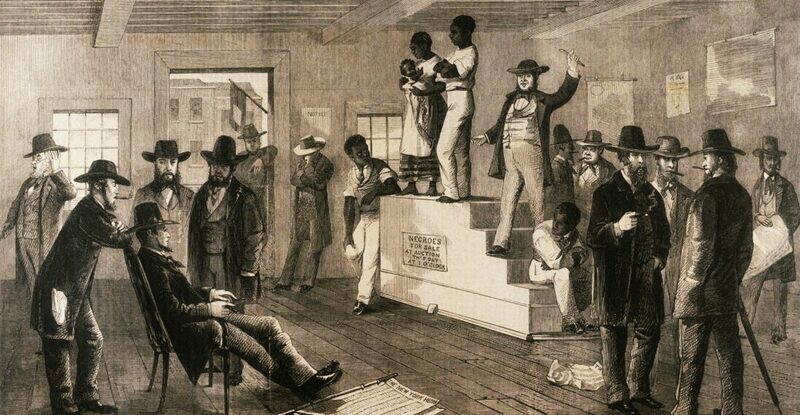 A couple of non-teachers were flabbergasted when I spoke to them about the slave auction lesson. One suggested that teachers should feel ashamed and embarrassed by teaching such a lesson. In response, I offered that I know as well as any teacher the constraints that their job places upon them too – little money, time or resources to do more than keep heads above water, especially in the inner-city schools. Any Continued Professional Development is usually spent undergoing courses selected by the department head, or focused on learning the most recent changes to the examination system. We all teach for different reasons – some teach for the joy of educating children and young adults; others love learning the content and historical facts; there are those that enjoy facilitating in the growth of the next generation and representing a pillar of society. These usually direct how we spend our fleeting spare moments – researching recent historical discoveries; creating new and exciting lessons to engage the pupils; giving our time to the school sport’s team or band. So I find it hard to feel ashamed at these teachers’ ignorance on the topic. They are not the ones that have used their spare moments to research race and its impact on schools as I know other teachers have. But many of them will have spent their time on other areas that benefit their pupils. I think one of the problems to point out is not simply that the classroom activity takes the perspective of slave traders and owners and once again silences the voices of their victims. It is that whatever the intentions of teachers, in an age when business studies courses use ‘The Apprentice’ in their teaching, then whatever the intentions of teachers, pupils are going to regard as successful their planning of trading in human flesh. The pupil who picks ‘best’, and gets most people alive to the plantations and sells them at the highest prices is the ‘winner’. For all that lessons about the economy of the slave trade are important, it is very hard to prevent this lesson assuming different shapes and significance in young minds, with humans becoming the objects of a Monopoly like exercise. What are the unintended, perhaps even subconscious lessons this may teach young people about the objectification of people by skin colour? Dylan William had written a piece just as I was entering teaching, where he explained that most teachers would not adapt their practice after the first two-three years: that many were simply repeating what they had learned, term after term, year after year. We can’t be like that. We need to take advantage of the excellent links we have built with the academic and heritage communities, amongst ourselves, to keep pushing forward and providing our children with the best education possible. It is time that local councils, national teacher unions, and here in Scotland organisations such as the Scottish Association of the Teachers of History, offer courses that explain how racially sensitive topics in the classroom can impact upon students of ethnic minorities, and then provide ways to teach various aspects of race in a manner that excludes no-one and benefits everyone. Until then, I would urge colleagues to continue the discussion, however awkward or hard that may be, and read Dr Traille’s important document, which can be downloaded with her permission, here; and Ian Phillips article looking at History and Maths, here. More articles on black history in schools can be found here. PhD candidate on the project, and former history teacher. 1. Husbands, C. & Pendry, A. ‘Thinking and feeling: pupils’ preconceptions about the past and historical understanding’ in Arthur J. & Phillips R. (Eds) Issues in History Teaching London (2000), p.132. 2. Kay Traille, ‘Teaching History Hurts’, Teaching History 127 (2007), p.32.